There were events all over celebrating 25 years of Mike Mignola's Hellboy, but at Things from Another World there was Hellboy beer. How could you beat that? March 23 is Hellboy day and comic shops (and other businesses) all over the nation were celebrating. 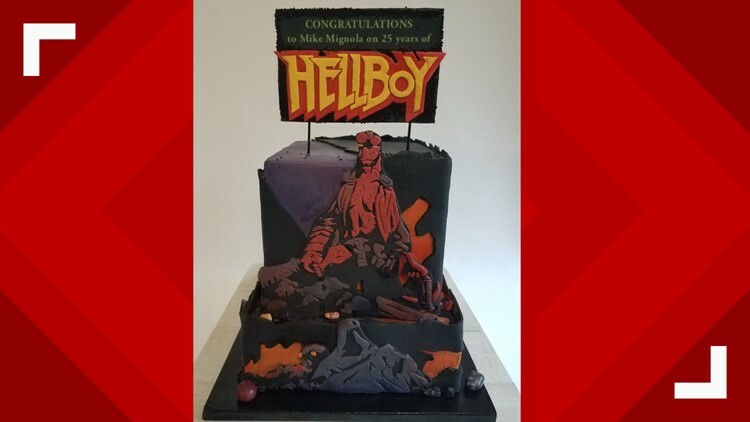 Here in Portland, the Broadway location of Things from Another World had artists of different Hellboy iterations, cake and beer -- how else do you throw a party? Dark Horse Comics and Gigantic Brewing were both at TFAW to celebrate with the first of six Hellboy themed beers that Gigantic Brewery is putting out. Ben Love, owner and brewmaster at Gigantic, said that the 70+ bottles they had brought sold out within the first twenty minutes. This shouldn't be too entirely shocking if you have heard anything about it: it's amazing. You can find the beer at some local retailers, like New Seasons. There was also a beautiful Hellboy Cake by Laurie Clarke Cakes that this author missed because she did not get to the event when it began. Tragic. Tyler Crook, Michael Avon Oeming, and Chris Roberson were there signing books and chatting with fans. According to TFAW workers and Dark Horse's PR person, there were a couple hundred people who breezed through the store to celebrate the big red demon of the hour. If you missed the event, make sure to find TFAW on Twitter and Facebook so you don't miss events from them in the future.